If you read this re-post from March 2018, you’ll know what he meant. Most everyone does it in Beantown because we believe that when you spend several back-breaking hours shoveling out not only the snow that fell, but the surplus snow the plows have dumped in front of your house, you’ve earned this spot – that you can pahk ya cah – and Gawd help the person who tries to pahk there the moment you drive away. The unofficial rule to this decades-old practice is that once you shovel out your spot, you have exclusivity to the spot until all the snow has melted. Which could take a while. This practice is so sacred that some people have been known to leave threatening notes warning that whoever takes their hard-won, shoveled-out parking spot risks bodily harm, and mysterious damage to their vehicle. 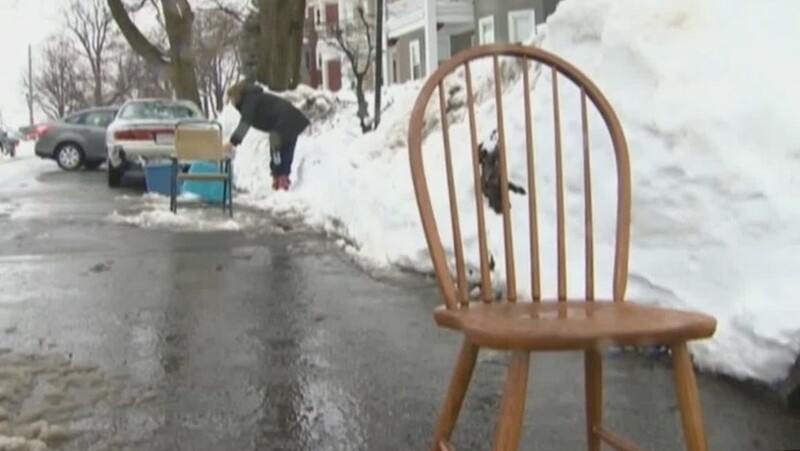 However, New Englanders are generally polite so the more accepted way of laying claim to the parking space is by putting a chair in the empty spot. Any chair will do – a folding chair, a beach chair, a bar stool. Over the years, I’ve seen some pretty funny stuff: an old toilet bowl, an anchored down Barbie Dream Car, and a plaster bust of Elvis. I now live on a street that vehemently adheres to space saving and my brother and I are facing a dilemma. We don’t have a chair we’re willing to sacrifice to the elements and place in front of our house. Do we go to the nearest discount department store to buy a cheap, dispensable chair? Or do we put something more unorthodox in front of our house as a space saver? We have plenty of rubble from my on-going house renovation. A discarded kitchen cabinet? The old stove? Or perhaps a slab of counter top with the sink still attached? My brother believes in the “go big or go home” approach, figuring the heavier the item, the greater the chance no one will move it and park in front of our house. In the end, we’ve decided to follow the “when in Rome” adage and we’re going with the chair.